So I bought a bonded pair of picasso clowns from my LFS. I was cleaning the glass today and I see they have laid eggs on the scraper. What do I do? Nothing. If you want to try to raise the babies at some point get all of the supplies and foods ready and raise a batch when you are prepared. Good luck fellow reefer on raising the babies. so how did the first 48 hours go? So far so good, looks like I've only last 1. How did this attempt turn out? have you had any success with the previous batches? Any tips you care to share? They're doing great, wednesday will be 21 days, waiting them to get a lil bigger before moving to the 10 gallon grow out tank. I have used reeds maricultyre for the rotifiers, and their culture system (5 gal bucket) comes with all ya need, i usually buy new rotifers, the week after they're laid (usually a sunday). The rotifiers arrive wednesday, and this give you 3 day to let the culture recover and grow. Saturday i start harvesting rotifers, and just dump them in my main tanks for the pods. The eggs usually hatch the following Tuesday night/wednesday morning. This point i turn a lamp on over them and get them rotifers. Hatch tank is only a heater and a bubble bar. The lamp stays on all the time. After a week start adding brine. The hurricane threw a small wrench, or i opted for instant baby brine. They ate it no issues. After that passed i introduced live hatched baby brine. I was worried anout the metamorphosis as that and the first 48hrs is the most mortallity rates. Only things i did differently this go around was i fed the rotifers 4ml of the algae they eat morning, noon, night. And i did half gallon water changes daily instead of 1 gallon. I used 4 gallons from the parent tank. The less frequent rotifer feedings needed to help keep them alive better than 6 or more smaller feeding. Ill get some pics of my set ups tomorrow. These are a few day old pics, 6 of the 7 have their first stripes. I went ahead and ordered the Reed culture system and some live rotifers. This clutch should hatch this Saturday or Sunday night. I guess I will pull out the flower pot Saturday night and put into the fry tank. It's a 10g with about 4 gal. fresh saltwater in it. I will add another 2-3 gallons of tank water Saturday morning. Hopefully things go better this time. Hatch tank 5 gal 3 sides painted black, heater and bubble bars, 10 gal grow out tank, just finished cycle, and the 25 lagoon. Yep, my 10g hatch tank is setup just like your 5g. Only difference is I have a 4" air stone instead of the long bars. I've actually got a powerhead in it right now with the air stone just to keep everything moving. I will pull the powerhead before I put the eggs in there. I haven't setup a grow out tank just yet. Kind of waiting to see if I can keep the fry alive through meta. I do have a sponge filter that's been floating in my display tank for over a week to get some bacteria going on it. I will just pull a couple of rocks out of my display tank to minimize any cycling. 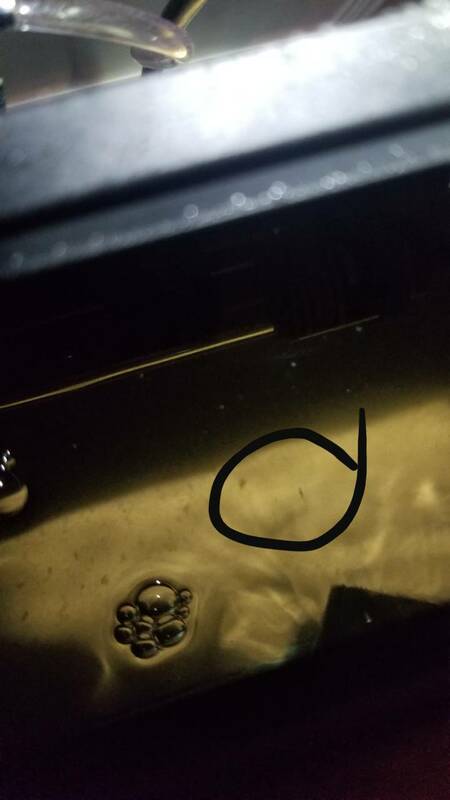 They parents can be seen in the bottom right corner of my display tank pic. My clowns first would lay on the aglae scraper, then on the back wall, last time was on the back of the powerhead. So the bars were easier, now that have a pot amd if the ever lay on it I'll have to switch to a air stone. I originally had one pot for the clowns, as shown in the picture. I bought 4 more off of Amazon and will just rotate them for each batch. I open up the hole in the bottom of the pot to about 1.5" diameter which seems to help with the water flow when it's in the display tank.